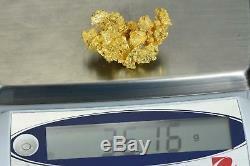 Australian Natural Gold Nugget Weighs 36.16. Grams Most of my Australian nuggets come from Victoria's Gold Triangle area. Australian nugget are very high in purity running from 94-98% pure. All Nuggets are Pictured or Partially Pictured with a U. S Quarter which is 24.5MM in diameter to give you an idea of Size Proportion. Natural Gold Nugget Pioneering from the Australian plains, fields, & the tip of a metal detector uncleaned direct to your living room...... Passion- Legacy-Experience - In November of 2013 I opened up my Gold Nugget store. With thousands of satisfied customers I will continue to strive to provide the highest quality, largest selection and best priced gold nuggets on. Through using my resources at the world number one Natural gold Jewelry Manufacturing shop once know as Conner's Jewelers and now the company Orocal. 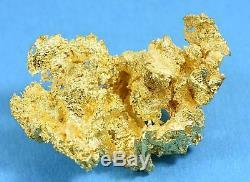 The item "#1247 Large Natural Gold Nugget Australian 36.16 Grams Genuine" is in sale since Friday, August 3, 2018. This item is in the category "Coins & Paper Money\Bullion\Gold\Nuggets". The seller is "nuggetsbygrant" and is located in us. This item can be shipped to United States, Canada, United Kingdom, Denmark, Romania, Slovakia, Bulgaria, Czech republic, Finland, Hungary, Latvia, Lithuania, Malta, Estonia, Australia, Greece, Portugal, Cyprus, Slovenia, Japan, Sweden, Indonesia, Thailand, Belgium, France, Hong Kong, Ireland, Netherlands, Poland, Spain, Italy, Germany, Austria, New Zealand, Singapore, Switzerland, Norway, United arab emirates, Qatar, Kuwait, Croatia, Malaysia, Colombia.